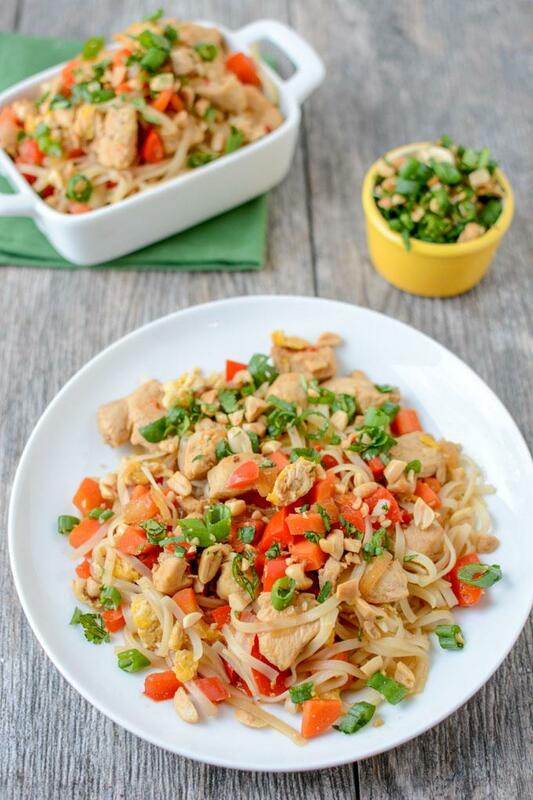 This quick and easy Chicken Pad Thai makes a great weeknight dinner. Full of Asian flavors, this recipe is gluten-free and ready in 20 minutes. Hope your week is off to a great start! 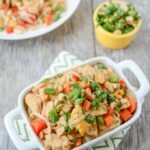 This recipe for Chicken Pad Thai is quickly becoming a weeknight favorite. I’ve made it a couple times in the past couple weeks, including over the weekend while my sister was in town! It tastes great warm, but in my opinion, it tastes just as good cold…which makes it ideal for leftovers. You could easily make this vegetarian by using tofu instead of chicken and using tamari instead of soy sauce keeps it gluten-free! It would also be great with shrimp! Make it spicier by adding some sriracha like I do, or leave it out if that doesn’t float your boat. Cook pad thai noodles according to package directions. In a large skillet over medium high heat, add all ingredients except the eggs and cook for 10-15 minutes until chicken is cooked. Move ingredients to one side of pan and crack and scramble eggs on open side of pan. Add pad thai noodles and stir until everything is well combined. Top with sliced green onions, minced cilantro and chopped peanuts if desired. Feel free to add extra veggies if you want! And if the noodles aren’t your favorite part, you could just use half the package! Let’s chat: Are you a fan of Asian flavors? What’s your favorite dish? 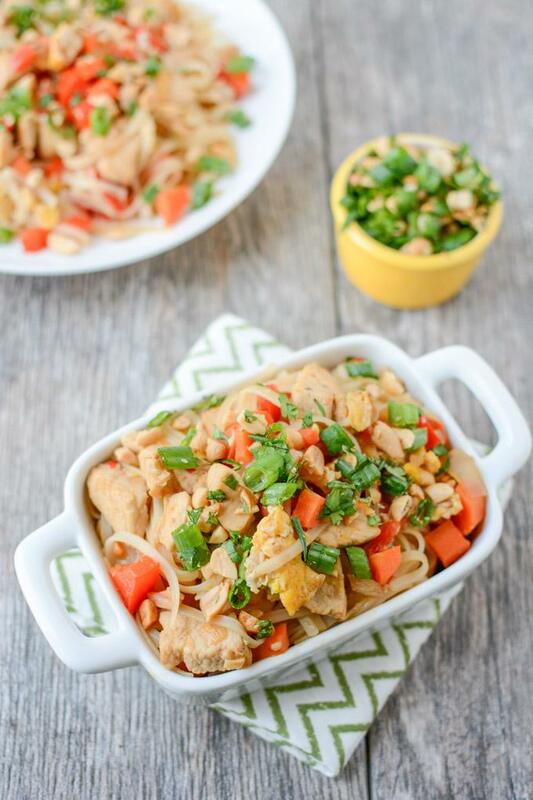 Add this Easy Chicken Pad Thai from @leangrnbeanblog to your dinner menu this week! Oh this does look like a recipe that could easily be a weeknight favorite over and over again! Lindsay, I love Pad Thai and love how easy this is. Pinning. Love me some Asian food the spicier the better! In grad school we used to go to a Korean place and get these ginormous bowls full of spicy goodness! im digging that plate of noodles! pinning it. I looove Asian style foods! I could eat them every day. My fiance isn’t the biggest fan but he loves the simpler Asian dishes, I think he would be a fan of this one! I love pad thai but never made it! Pinning this for later! Pad thai is a favorite of mine! My mom learned how to make it from a Thai woman who ran our local Thai market. I love Pad Thai and I have not had it in a really long time…I wouldn’t mind having this tonight as it is grey, cold, and windy right now on the island and comfort food sounds DELISH! I’ve always wanted to make pad thai at home. Your recipe looks easy and healthy – a must try! I love pad thai!! This looks and sounds wonderful. OMG this looks just like my favorite pad thai from our local Asian restaurant! It looks so delicious and I’ve definitely got to try this! Thanks.